August 27, 2011 by Alphageek in "alphageek", "discovery", "equipment"
The site has been somewhat heavy on the reviews lately. While we were on a short vacation, we stopped by several great restaurants that have already ended up here on the site. One of the things that the site is still short on is some general suggestions on cooking. We are going to increase the number of articles on cooking, and equipment, and what ever else strikes our fancy in the world of food, so keep checking back. We are at the start of Hurricane Irene working through as I write this. We don't expect much excitement this far east, but one never knows. I just tossed that thought in at random. This is my column, and I get to write what I want to. We stopped by a kitchen equipment store when we were in Greenville, Joyce Equipment. Kitchen stores can be great things to find supplies for anyone that likes to cook. I thought I would post a picture or two, and give you some suggestions on good things to buy, as well as tell you what I bought. I would post a link to the store, but their web site seems to be on the fritz right now, so you will have to search on google yourself. I can't do everything for you. I always love the scale of the equipment at restaurant stores, as well as the equipment being a little more functional that what one can get at Target. I like to look around, and see what I can buy to replace some supplies in the kitchen that are not getting it done for me. Before we get to my purchases, I just wanted to show you a couple of things. 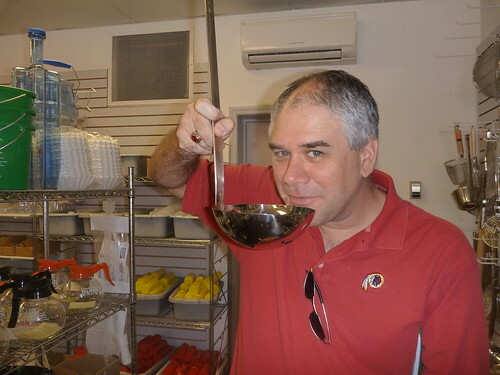 Below is me holding a big ladle. I think it is really cool that you can buy a ladle that is as big as your head. Imagine how fast you can scoop soup out with that thing. I will try to get a better model next time. Stores like this always have a bunch of pots. Okay, I don't really need them, but these are pretty cool. 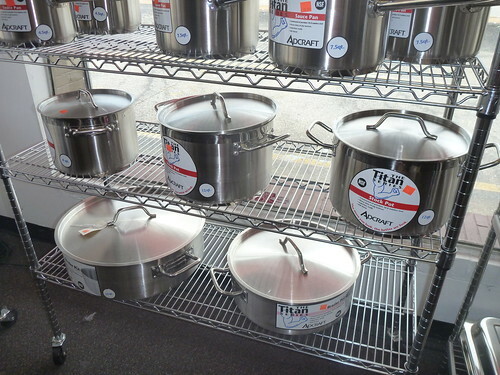 These kind of pots are great if you need something really big for that cooker outside, or to make a big batch of chili. I would like an extra large for the extra large burner we have on our inside stove, but Mrs. Alphageek does not seem to like the idea, and we would use a pot like that about every other year. You also can buy more whisks that you could ever imagine. 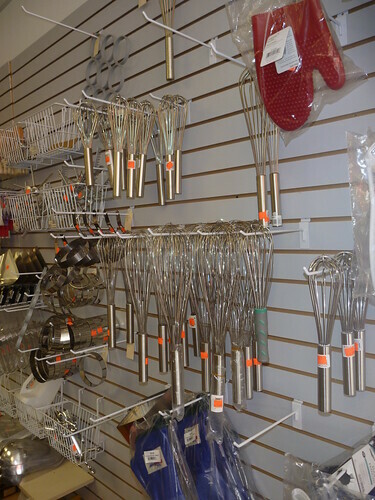 These stores sell a wide variety of whisks, and some of them are pictured below. Whisks are a good place to start talking about what is good to purchase here. I like the whisks that one can purchase at these kind of stores. Unlike a whisk one purchases at Target or some other box store, these whisks are much better made. The whisks from places other than restaurant supply stores usually either rust, or fall apart, or do both at the same time. Bad equipment makes cooking a chore. I purchased several whisks at anther supply store about ten years ago, and they still work as well as they day we bought them. Another item to get here are tongs. The thought is the same. They sell quality tongs here that will not let you down while you are cooking. I think the tongs are great for the grill too. We purchased some at the same time as the whisks, and the only reason the tongs are not around is that we have misplaced them over the years. The simple design of what you get here enable the tongs to work for years. Since these tongs are usually all metal, don't leave them on the heat too long, unless you are wearing some sort of insulated gloves. We took a look around, and the geek in me could not leave without a couple of small purchases. One was a really small funnel. This funnel is great for filling up small containers of things like vinegar. I like the funnel to help pour bourbon into a flask too. We also found a measuring cup that has different measures on it. Instead of the usual cups and ounces, it has teaspoons and tablespoons. It is great for when you are doubling a recipe, and don't want to measure out six tablespoons of something. We hope you find these ideas useful. Let us know if you have any equipment ideas through the feedback function.